Dr. Ernie Ward is proud to call himself a 1992 graduate of the University of Georgia College of Veterinary Medicine (“Go Dawgs!”). He started his award-winning clinic, Seaside Animal Care, in 1993. His deepest passions involve the prevention of illness and preservation of optimal health. He has been instrumental in developing Senior Pet Health Guidelines and is a founder of the International Veterinary Senior Care Society (IVSCS), founder of the Association for Pet Obesity Prevention (APOP), developed the most widely used Long-term Medication Monitoring protocols, and was a leading voice in the fight against over-vaccinating and promoting extended-duration vaccination practices for dogs and cats. If it involves preventing disease in animals, chances are Dr. Ernie was involved with it. He is author of Chow Hounds: Why Our Dogs Are Getting Fatter - A Vet’s Plan to Save Their Lives. Dr. Ernie Ward has authored over 65 veterinary journal articles, texts, and four veterinary training videos. His works have been published in the US, Canada, Japan, England, Spain, France, China, Taiwan, Hungary and Portugal. He is a popular lecturer, was voted "Speaker of the Year" for the North American Veterinary Conference and Western Veterinary Conference, and has been the featured veterinarian for the “Rachael Ray Show” since 2007. 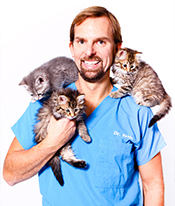 Dr. Ward has been a spokesman for the profession on Animal Planet, CNN, “NBC Nightly News,” “Today,” "Good Morning America," and “Nightline” as well as all of the nation’s major newspapers and pet and health magazines. Dr. Ward lives in coastal North Carolina with his lifelong love, Laura, their two daughters, two dogs, and two cats. When he’s not practicing veterinary medicine, Dr. Ward is an endurance junkie, avid Ironman triathlete, and wanna-be world-class surfer. His family (and dogs) enjoys paddle boarding, swimming, scuba diving, and refining their vegetarian recipes. Yes, even his dogs relish his cooking. Dr. Ward and his veterinary practice have received numerous awards and recognitions over the past twenty years. For more information, visit www.DrErnieWard.com or find him on Facebook.